04/15/14 K62. Flake knife, 7 7/8" L x 1 1/4" W x 3/8" T, Giseh (Gizah) Plateau, Egypt, high-quality brown flint with some residual cortex, heavy deposits on the flat side, extra large, superb example, very rare in this size, $495. 04/15/14 K62a. Other side of the above. 04/15/14 K62b. Side view of the above. 09/09/13 K63. 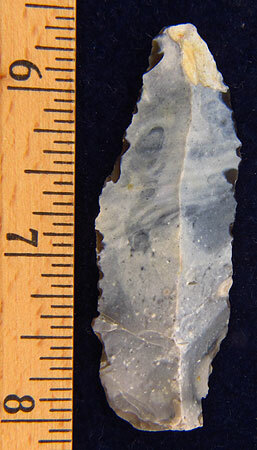 Sickle blade, 4 1/8" L x 7/8" W x 1/4" T, Israel, tan chert, been in my personal collection since 1998, lots of edgework\use wear, thin and flat with plenty of gloss from cutting grains or grasses, tools from Israel are hard to come by and this is a real beauty with good size and form, $125. 09/09/13 K63a. Shot of the worked edge. Unfortunately the picture doesn't show the silica polish from cutting plant material. 09/09/13 K64. 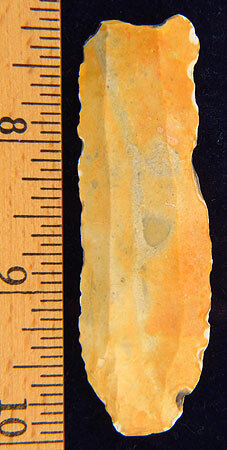 Blade, 3 13/16' L x 7/8" W x 1/4" T, Israel, striped tan chert, been in my personal collection since 1998, thin, flat and still very sharp, some edge wear, very nice with good size and form, tools from Israel are hard to come by, $105. 09/09/13 K65. 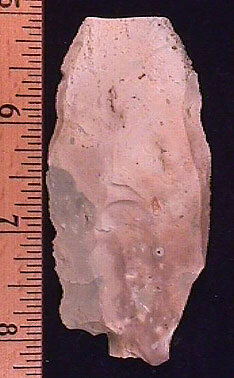 Prismatic blade, 3 1/8" L x 13/16" W x 3/16" T, Israel, pinkish-tan chert, translucent around edges, been in my personal collection since 1998, thin, sharp, and relatively flat, scar from a previously removed blade gives this beauty a comfortable flat back making for a perfect hand-held knife, dual notches on base may be intentional, tools from Israel are hard to come by, $95. 09/09/13 K65a. Close-up showing notches. Awesome graver? 09/09/13 K66. Created blade\end scraper, 3 5/8" L x 13/16" W x 3/8" T, Israel, high quality tan chert, been in my personal collection since 1998, fine end scraper on the narrow end and broad scraper\burin on the wide end, super tool, almost flat, tools from Israel are hard to come by, $95. 09/09/13 K66a. Close-up of the end. 09/09/13 K67. 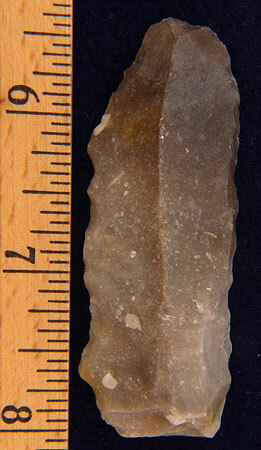 Prismatic blade, 3 1/4" L x 3/4" W x 1/4" T, Israel, tan chert, been in my personal collection since 1998, well made and flat, fits well in hand, tools from Israel are hard to come by, $80. 09/09/13 K68. Prismatic blade, 3 5/16" L x 5/8" W x 3/16" T, Israel, tan chert, been in my personal collection since 1998, well made and flat, fine edgework, fits well in hand, tools from Israel are hard to come by, $85. 09/09/13 K69. 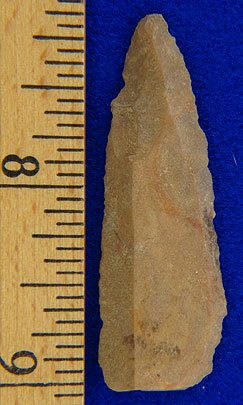 Trihedral spear point?, 3 1/8" L x 5/8" W x 5/16" T, Israel, tan chert, been in my personal collection since 1998, shows evidence of being hafted, notice light flaking around base, base is polished, very nice RARE example, tools from Israel are hard to come by, $115. 09/09/13 K70. 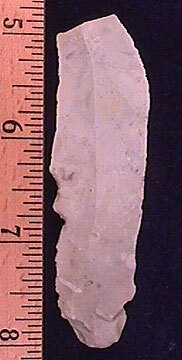 Blade, 2 7/8" L x 5/8" W x 3/16" T, Israel, light pink chert, been in my personal collection since 1998, thin and well made with use wear, base has been flaked forming a small gouge-like form, tools from Israel are hard to come by, $80. 09/09/13 K71. 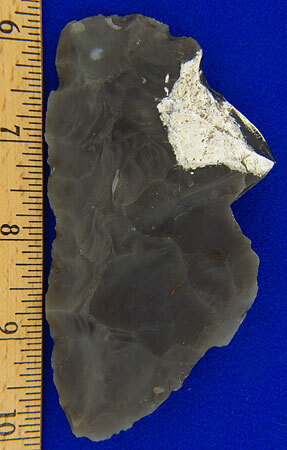 Backed blade, 3 5/16" L x 3/4" W x 1/4" T, Israel, mottled tan chert with some gray, been in my personal collection since 1998, right (looking at photo) has been dulled to protect finger, fits the hand well, tools from Israel are hard to come by, $70. 09/09/13 K72. Blade, 2 5/8" L x 9/16" W x 3/16" T, Israel, pink chert, been in my personal collection since 1998, well made with fine edgework, some light use wear, tools from Israel are hard to come by, $40. 09/09/13 K73. Blade, 3" L x 1/2" W x 3/16" T, Israel. tan chert, been in my personal collection since 1998, scar from a previously removed blade gives this beauty a comfortable flat back making for a perfect hand-held knife, fine edgework with some gloss, tools from Israel are hard to come by, $49. 09/09/13 K74. 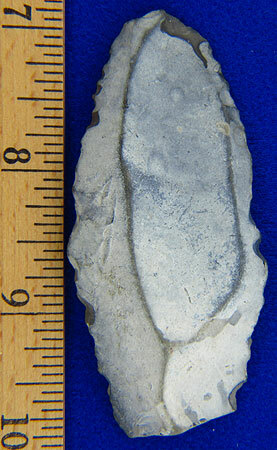 Blade or possibly a projectile point, 1 15/16" L x 5/8" W x 3/16" T, Israel, tan chert, been in my personal collection since 1998, reworked base and dulling of the edges makes this into the perfect point to tip a weapon, very unusual so may have to keep this one, tools from Israel are hard to come by, $95. 09/09/13 K75. Backed blade, 2 7/8" L x 9/16" W x 3/16" T, Israel, glossy olive green material, been in my personal collection since 1998, fine edge work, awesome color, appears to have been broken and glued back tight, tools from Israel are hard to come by, a bargain at $29. 09/05/13 K76. Danish sickle, 4 1/4" L x 2 3/8" W x 5/8" T, Hindsholm, Funen, Denmark, dark gray flint, ex- B. Mondel and Watson collections, very interesting piece showing lots of use wear, resharpening by removing a long flake across the cutting edge to renew the working surface, spoke-shave flaked in to the notch, and I believe the sickle was handheld given the configuration of the curved edge, perfect finger rest in the area showing residual cortex and it just fits the hand, $50. 09/05/13 K76a. Other side of the above. 09/05/13 K76b. Showing some edgework. Much nicer in hand. 09/05/13 K77. 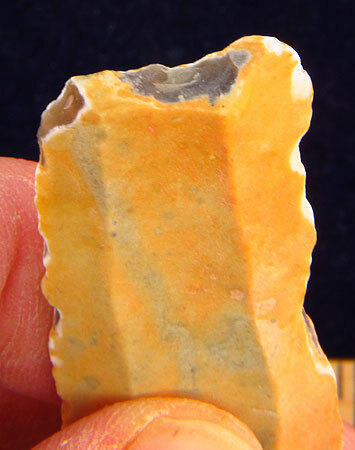 Mesolithic prismatic blade, 2 7/8" L x 1 5/8" W x 5/8" T, County Antrim, Ireland, tan cobble chert with an orange bog patina, use wear along cutting edge, ex-W. Huntsman collection, you don't see many artifacts from Ireland on the market, $85. 09/05/13 K77a. Edge view of the above. 09/05/13 K78. Danish flake knife, 3" L x 1 3/8" W x 7/16" T, Denmark, gray flint with a beautiful light blue salt-water patina, very, very nice, $25. 09/05/13 K78a. Edge view of the above. 08/14/13 K79a. Edge view of the above. 08/14/13 K80. 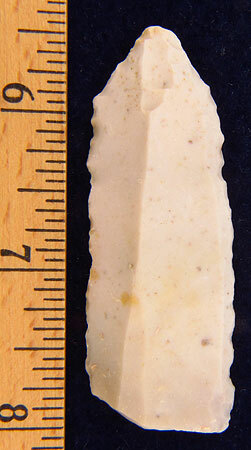 Neolithic blade, 2 7/8" L x 15/16" W, Funen, Denmark, tan flint with a beautiful glossy white saltwater patina, iErtebolle Culture 5,500 B.C., serrated blade, $25. 08/14/13 K81. 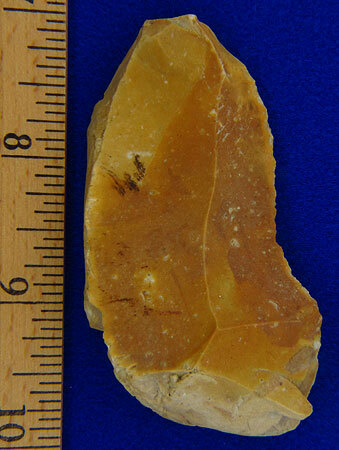 Neolithic blade, 3 1/8" L x 1" W, Denmark, glossy light brown flint, nicely retouched edge with small shaft-scraper, good color and size, $20. 08/14/13 K82a. Side view of the above. 08/14/13 K82b. View of end scraper showing detail. 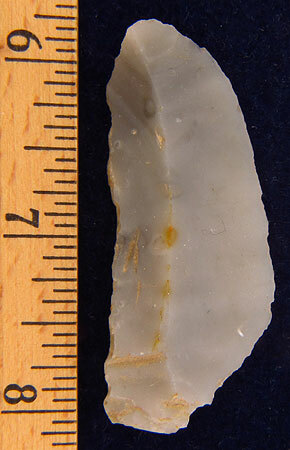 Notice the look of the patina verses the original color of the flint. 08/14/13 K83. 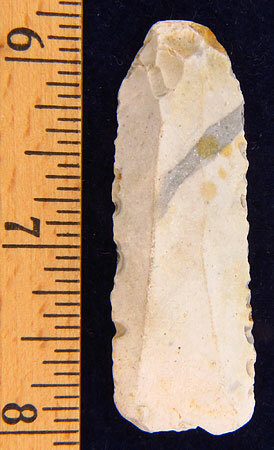 Neolithic blade insert, 2 3/8" L x 1" W, Denmark, glossy blue-gray flint, Ertebolle culture, 5500 B.C., fine edge work, $15. 08/14/13 K83a. View showing back edge blunted for insertion in to sickle. 08/14/13 K83b. View of cutting edge. 08/14/13 K85. 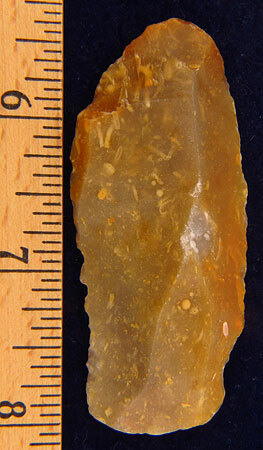 Neolithic blade, 2 3/4" L x 1 1/8" W, Funen, Denmark, Ertebolle Culture 5,500 B.C., tan flint with amber patina, lot of retouch and use wear, $16. 08/14/13 K87. 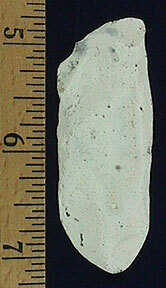 Mesolithic blade, 2 1/4" L x 3/4" W, Ulbjerg, Jutland, Denmark, well made, glossy white saltwater patina, $13. 08/14/13 K88. 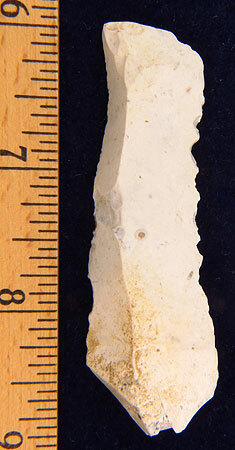 Neolithic blade, 2 11/16" L x 1" W, Funen, Denmark, glossy brown and gray flint, robust and well made\used tool, Ertebolle Culture 5,500 B.C., nice edge work, $13. 07/24/13 K89. Prismatic blade\knife, 5 1/4" L x 1 5/8" W x 7/16" T, Northwestern Sahara desert, mottled gray with some red, nice robust blade with a little retouch on the working edge, a few tiny modern flakes on the edges but not very noticeable, excellent example that feels good in the hand, $25. 07/24/13 K89a. Other side of the above. 07/24/13 K89b. Side view of the above. 08/02/11 K90. (K79) Bifacial blade, 4 5/8" L x 1 11/16" W x 5/8" T, Burkina Faso, sub-Sahara Africa, glossy brown patinated lighter brown on the one side, big and well made, robust blade made for serious work, some ancient use on the one end, $39. 08/02/11 K90a. (K79a) Other side of the above. 08/02/11 K90b. (K79b) Side view of the above. 08/02/11 K91. (K89) Heartbreaker of a dagger, 6 1/16" L x 2 1/16" W x 5/8" T, Burkina Faso, sub-Sahara Africa, green, brown, and other colors, heavily ground "hilt", salvaged and was finally used as a scraper (at least two separate scraping areas, awesome example of a salvaged tool with great size, a true handful, $49. 08/02/11 K91a. (K89a) Other side of the above. 08/02/11 K91b. (K89b) Side view of the above. 12/16/09 K92. 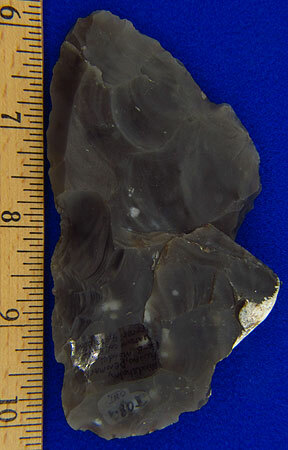 (K91) Neolithic blade, 2 7/16", Ulbjerg, Jutland, Denmark, heavily patinated gray flint, ex-Mondel and Sorensen collections, thin and well made, water find, $10. 12\03\08 K93. 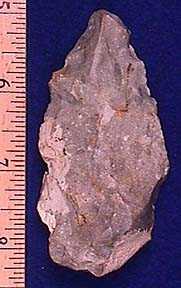 (K92) Huge uniface Neolithic keeled blade, 7 1\2" (19cm), found Wild Street, Beck Row, Suffolk, Great Britain, rich coffee brown on the flat side and mottled tan on the keel side, ex-Rob de Ruiter and F. S. Clark collections, rare in this size and a real monster of a blade from my personal collection, $125. 01/15/08 K94. (K93) Blade, 3 3/16", Syria, glossy brown flint, nice edge work, $35. 09/292007 K95. 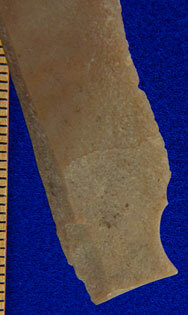 (K94) Danish Neolithic crested/tri-sided blade, 5 3/16", Denmark, most likely gray flint with a glorious red and orange patina, Single Grave Culture, well made with good size, RARE, $59. 04/01/02 K100. 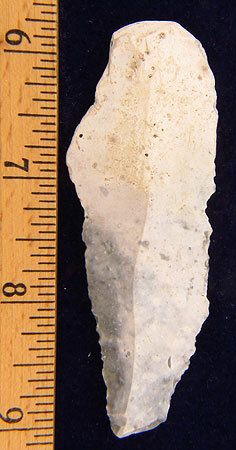 (K78) Biface knife/point, 3 3/8", Spiennes, Belgium, gray flint. 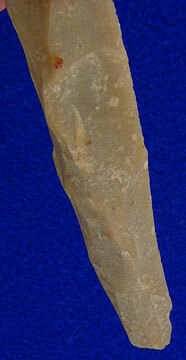 A big heavy-duty knife or point from a site known for its flint mines, ex-Dominic Hootele collection, $25.